As mentioned in our post about the availability of more than 2000 Free PowerPoint Templates at FPPT, we explained how SlideOnline had sister projects like FPPT and SlideHunter. 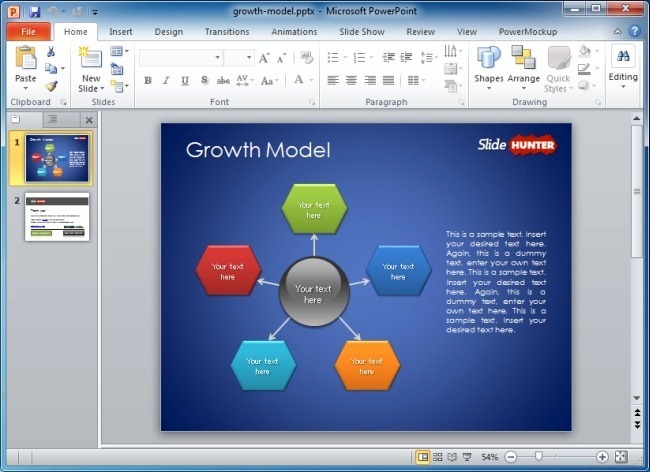 While FPPT was meant to provide free PowerPoint Templates on diverse topics, SlideHunter was designed as a haven for business professionals looking for attractive PowerPoint Templates and Business Diagrams (including 3D diagrams for PowerPoint). While you can always upload your PDF or PowerPoint Presentations to SlideOnline, you might find it worth your time to browse through the more than 700 (and increasing) Business PowerPoint Templates, Diagrams and Illustrations at SlideHunter. Whether you require presenting a presentation from your browser using SlideOnline or wish to give a presentation offline, the visually appealing business backgrounds, templates, illustrations and business diagrams at SlideHunter can help you prepare an eye-catching presentation in a matter of minutes. The Free PowerPoint Diagrams at SlideHunter have been specially designed to cater for the needs of people who may be looking to present a business analysis or concept in their presentations. The below image shows a template from SlideHunter with the DESTEP analysis model. 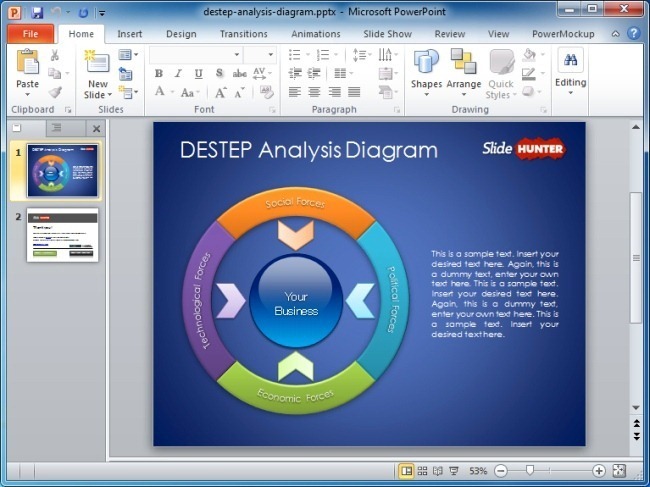 You can download this DESTEP Analysis Diagram Template and other types of PowerPoint themes and illustrations to create presentations which may help you depict standard business analysis models and concepts. Similarly, the Employee Handbook Template shown below is a good example of how you can benefit from the free presentation content at SlideHunter. Such a template can be used for making a presentation for the orientation of new employees. This template has been embedded below to show you the various sample slides in it. You can Download Employee Handbook Template in PPTX format for offline use. The below example is also a good reflection of how you can Upload PowerPoint presentations to share them freely via direct link, embed code and social media using SlideOnline. Suffice to say, we highly recommend the use of PowerPoint Templates, backgrounds, diagrams and illustrations at SlideHunter for business presentations. Having said that, there are also other types of free presentation templates at SlideHunter for academic, commercial and personal use that you can benefit from, such as the various 3D PowerPoint templates and Animated PowerPoint Templates, which come with editable animations for PowerPoint and Keynote. One more aspect of SlideHunter that you may find quite refreshing is that it also offers presentation tips, tutorials and product reviews to help users create better presentations, more efficiently.